As electric cars slowly start to creep onto the road, T3 is already looking at the next big thing in motoring, hydrogen fuel cell powered cars. 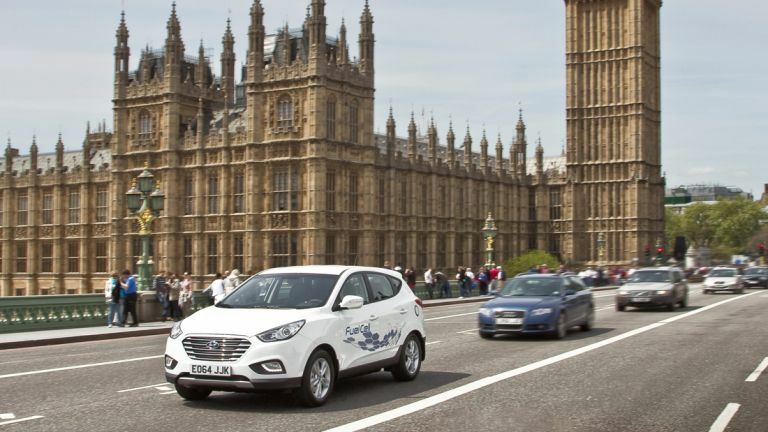 Yesterday (October 8) we took the Hyundai ix35 Fuel Cell around the streets of London, andunlike the BMW i3, we didn't crash this time. We drove this car as part of an initiative called 'A Streetcar Named Hyundai', which involves driving, photographing and filming all 2005 miles of central London's streets over 50 days -- in a car that emits nothing but water! You see, that's the benefit of hydrogen powered cars. Without trying to get too technical, burning fuel to turn a turbine which creates electricity is inefficient. Electric battery powered cars get their juice from coal-burning power stations, although much cleaner than petrol and diesel (especially diesel) powered cars, they just move the CO2-production further down the line. Hydrogen fuel cell cars are very similar to electric vehicles, they run on battery power, but instead of the battery charging from the mains, it's charged from a chemical reaction in the fuel cell. Fuel cells are much more efficient, and only produce water as a result of the chemical reaction. The car drives exactly like an electric vehicle, silent with instant torque. And it can be refueled like a petrol car, negating the much-dreaded electric range anxiety. Best of both worlds, right? Of course, it's not all roses. At present, there are only two hydrogen refueling stations near London, at Heathrow and Hendon. Not exactly convenient. There's also a question of how hydrogen istransported, right now, it's probably going to be in a diesel-powered lorry. So there's still a CO2 footprint attached to it. Is hydrogen the fuel of the future? From our short time experiencing it, we have no doubt it will be. It's just a matter of building the infrastructure.